Living in Shishmaref has exposed us to all sorts of culinary delights. I have eaten things I never dreamed existed. Steve, however, has been a little more cautious about Eskimo food (he always brags about all the crazy stuff he ate on his mission in Brazil, but he can't handle a few marine mammals. Weakling). I thought I would introduce you to a few of the common Shishmaref delicacies. 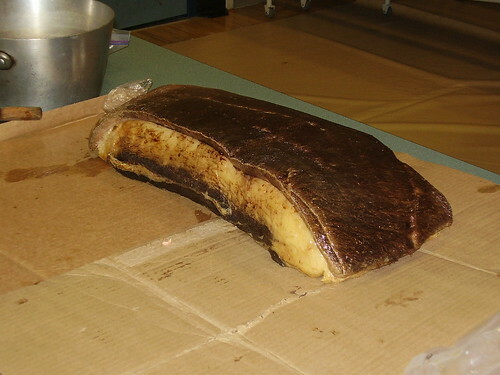 This is what walrus meat looks like when the walrus is no longer alive. 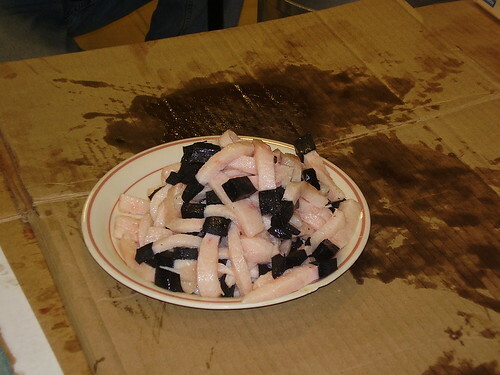 The walrus fat is called koq (pronounced "coke"; my Inupiaq spelling is pretty poor, f.y.i.). These are walrus flippers. They usually bury the flippers until they ferment. I've never actually eaten fermented walrus flippers, but I have eaten fermented seal flippers. They are really chewy. I chewed each bite for about twenty minutes. 🙂 It had a strong flavor, but it wasn't bad. The knives around the flippers are called ulus. Ulu means woman's knife. It is the traditional knife for butchering and scraping. We have an ulu. It is the best knife ever. I use it to cut all of our meat, chop vegetables, and as a pizza slicer. 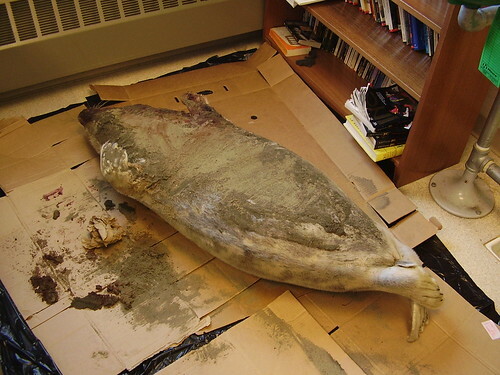 This is a seal before being butchered. If it looks a little stiff it's because it's frozen. And also dead. 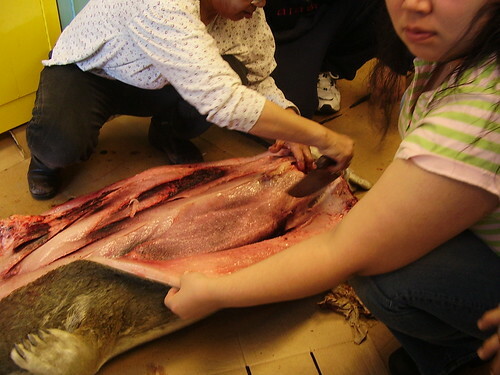 This is what the inside of a seal looks like as the skin is being pulled away. Notice the paw in the bottom left corner. It looks kind of cute except for the claws. They're long. And sharp. 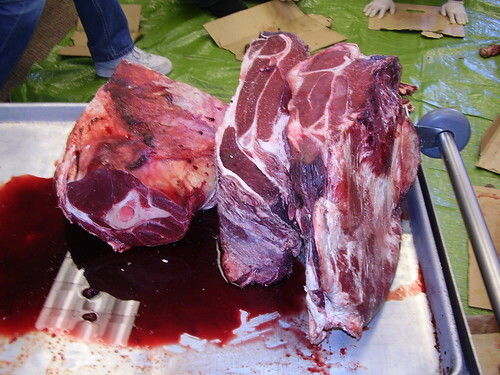 After the meat is removed, the blubber is scraped off. Then the skin is dried, tanned, and ready to be sewn. 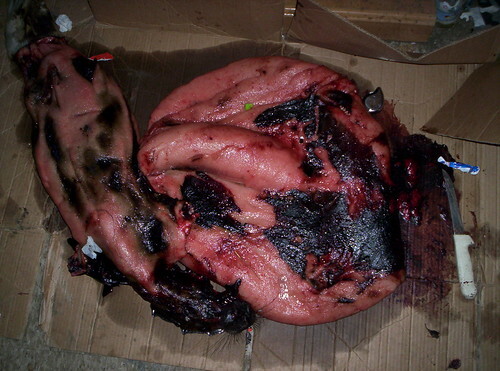 This is raw caribou meat. It can be butchered into roasts, steaks, ribs, and pretty much any other cut of meat. 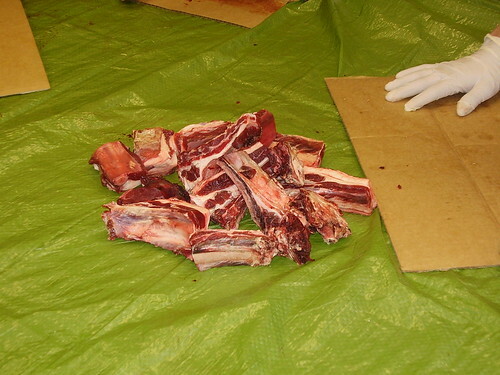 These are caribou ribs. 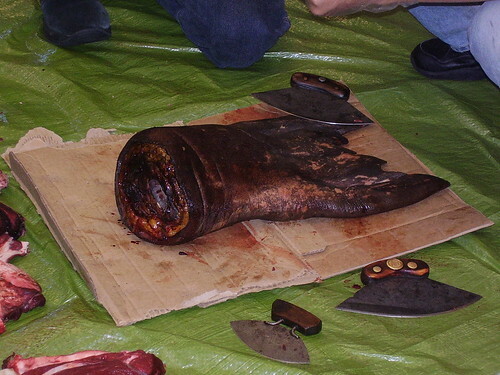 Some of my students butchered them during Inupiaq days our first year here. Caribou is awesome! It tastes a lot like beef. Great flavor. Steve thinks it's a little greasy, but I don't mind it. Caribou is often made into stew. Caribou stew is served at all village potlucks. This bowl is from the Thanksgiving feast. (I apologize for the insanely blurry picture. It was taken in the days before I had a decent camera.) 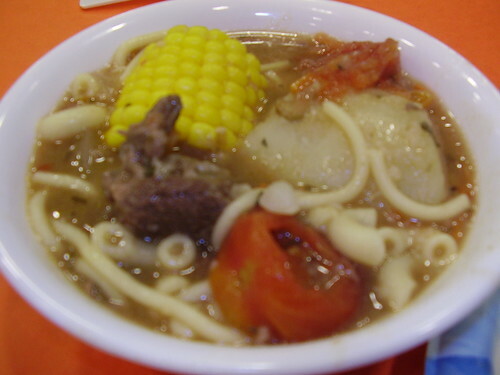 The stew often includes corn on the cob, stewed tomatoes, and spaghetti noodles.